14th November, Paris. The OECD’s Business & Industry Advisory Committee (BIAC), which provides a high-level forum for the private sector to provide inputs to OECD’s strategic agendas, convened a senior meeting of companies, banks, trade unions and governments to discuss the private sector’s delivery of the Sustainable Development Goals. Earth Security CEO, Alejandro Litovsky’s presentation guided a strategic discussion of how the private sector and governments can work together more effectively at a greater scale. The OECD has called the private sector the ‘missing piece of the SDG puzzle’ for governments. Litovsky’s presentation focused on how to resolve sensitive issues behind the SDG & business agenda, such as labour rights and forced labour in global supply chains across a variety of global industries, as well as governance and corruption. 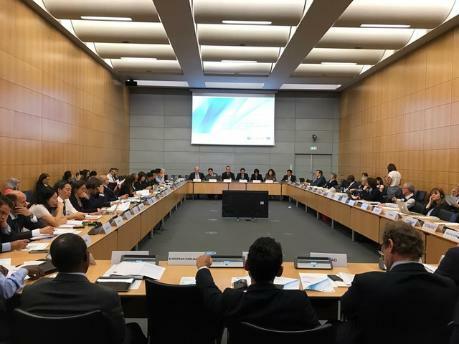 Drawing on OECD’s track record on these issues, Litovsky provided the meeting with practical proposals for how ‘business diplomacy’ and a strategic engagement of industry with policy-makers can help remove barriers to responsible investments. BIAC’s Development Committee was Chaired by David Croft, Diageo’s Group Sustainable Development Director. In addition, senior leaders at OECD, including Mari Kiviniemi, OECD’s Deputy Secretary-General; Bernhard Welschke, Secretary General of Business at OECD and Charlotte Petri Gornitzka, Chair of OECD’s Development Assistance Committee, provided the meeting the right focus for the emerging recommendations to gain traction within OECD’s agenda.